Guest post by Sheba Mohammid, a fellow on the Why We Post project. Sheba is a PhD candidate at RMIT University in Digital Anthropology/ Media and Communications and was previously Coordinator of the National Knowledge Gateway of Trinidad and Tobago. I recently had the opportunity to conduct an 18-month ethnographic study of digital media use and learning in Trinidad and Tobago. In the process of analysing the findings, the Why We Post Massive Open Online Course (MOOC) was also being designed. The Why We Post team at UCL had a genuine interest in making their research available to the widest possible audience in learner-centred ways. One of these approaches is the MOOC that is currently making its second run. The team also has a keen interest in improving the MOOC and also seeing where the MOOC fits in a menu of resources. MOOCs have been in mainstream discussion, garnering both praise and critique. As my research on out-of-school learning was wrapping up and the MOOC was being created, there was further opportunity for discussion on the challenges and opportunities in making an effective MOOC and what this could potentially mean. In following my participants, my research focused on a low-income community. Here I found learning being performed in complex and nuanced ways that resist simplistic pedagogization but still produce some probing questions for considering the multiple dimensions of MOOCS and how they fit into the ecosystemic learning practices I observed. Participants interested in informal/non-formal learning in the community I studied practiced their knowledge creation, sharing and use in complex ecologies that incorporated multimodal resources, searching, finding and problem solving in online and offline contexts. The reality, though, is that they weren’t using MOOCs. Some were not aware of the courses available while others were not interested in signing up. This resistance was often blamed on time constraints but deeper discussion often revealed that there was a reluctance to take a course because of the pressure that they often associated with formal classes. This was often based on poor educational experience or attainment in their past formal schooling. These participants however did employ many strategies for learning in their day to day lives that often used video resources and interactions that were outside of a bounded course. This may, on one hand, lead to a debate between the virtues of xMOOCs and cMOOCs, but it also begs a deep consideration of where MOOCs fit in the ecosystemic approaches to learning that acknowledge that people traverse a variety of everyday terrains in their learning. Does the MOOC fit into a wider ecology of resources where people who want to view the videos separately, for instance, are free to do this while the people who want to take a structured course can sign up for it? Should the MOOC itself be resistant to being a replication of a classroom and start thinking of more fluid ways that encourage different approaches? For instance, my study participants often associated traditional education with a measure of shame-based learning where failure was very much maligned. The identity of the learner and his/her feelings of success were often tied to being able to demonstrate getting things “right” in very public ways. In studying the social dynamics of informal learning among my participants, I observed that their practices involved deep negotiation of failure, experimentation and non-linear, iterative learning. A lot of normative discourse about the internet emphasises the potential of technology to promote collaboration. I found that the dynamics at play were more complex than this as people were also using the internet in their learning to navigate sociality in ways that allowed for privacy for their own experimentation. People who were learning crafting through YouTube videos often confessed that they had never saw themselves as creative nor felt comfortable in school settings unless they thought they were good at a particular subject. They were however willing to invest time in processes of trying, failing and experimenting using YouTube videos on their own. The internet was a resource that allowed them greater control of their privacy in learning. They were then able to negotiate when they would share their process for feedback within their communities. Collaboration is often emphasised as a key facet of learning in MOOCs. Does collaboration become forced, however, and a tyranny in itself that does not acknowledge the multifaceted ways that people learn through individual reflection, privacy, sharing and interaction? The communities my participants were involved in often were not online or based on a shared subject interest but a mix of their everyday relationships. If the participants in Trinidad and Tobago were being measured on online participation such as uploading their own videos or comments, it would seem that they were not particularly active. When their learning practices were viewed in relation to the wide ecosystem of their everyday lives and the complex sociality therein, it became clear, however, that they were moving through a number of offline contexts sharing and constructing their knowledge. It was not only their competence in their expertise that affected their perceptions of performance. A dimension I saw as social confidence or confidence within and of their social contexts was as key a factor as subject content. These Trinis were navigating their learning, interactions based on feelings of social confidence as they were negotiating their social confidence itself. How do we best conceptualise the MOOC as a resource and a space in a wider ecosystem of resources and spaces? How do we factor for design that values the nuanced dynamics of an ecology of learning in which people have spaces for individual reflection and interaction? How do we incorporate offline elements into MOOCs that leverage everyday communities and relationships? How do we create spaces where people can build subject competence and social confidence? How do we measure MOOC success on the intent of the people who are using it as a resource? Are completion rates the best measure or is utility to participants based on their criteria a better success factor? MOOC architects, designers or users are still in the process of negotiating the answers to these themselves. But in starting with the participant’s perspectives and the complex dynamics of their practice, we are creating an agenda to improve learning in ecosystemic ways with MOOCs playing a role in this ecology. 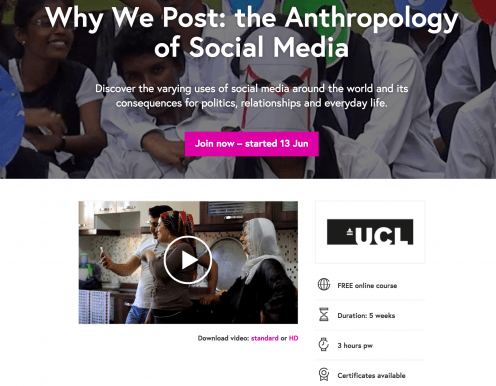 Are you currently taking the Why We Post course on FutureLearn or have you previously taken other MOOCs? Where do you see the MOOC fitting in your wider learning? Was it a successful experience for you?